As well as a trio of fitness wearables, Samsung also released an all-new cordless vacuum cleaner today at IFA, meet the POWERstick PRO (their caps, not ours). The Powerstick is powered by Samsung’s Digital Inverter Motor which the company claims "spins faster than a tornado". 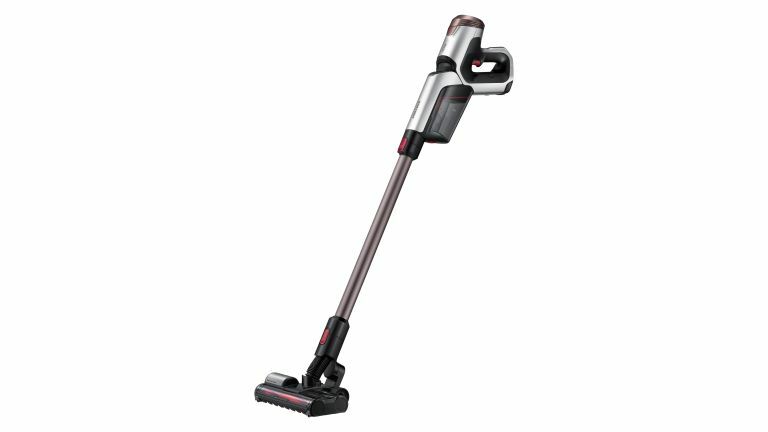 It packs 150W of power and claims industry-leading suction. Samsung has replaced traditional brushes found on conventional vacuums with a Dual Action Brush, which consists of two brushes, each with a separate drum, to pick up dirt better. The brush spins at 5000rpm, moving in opposite directions to capture both fine dust and large particles in the centre of the head. Powerstick Pro features a large 32.4V lithium-ion removable power pack that offers up to 40 minutes of battery life. Samsung has tried to take the strain out of cleaning with a patented ergonomic Flex Handle, which folds up to 50-degrees, which makes reaching tricky parts easier and minimises strain on your wrist and back. The bin empties with one quick pull leaver, and the entire dustbin structure can be detached and washed with water. Lastly, the Powerstick Pro comes with 5 additional tools to enable users to pick up dirt from a wide range of surfaces.